Albuquerque's Uptown neighborhood provides an upscale, urban feel in the heart of the city. It has a bustling night life, fine restaurants, lots of shopping, and is an easy commute to all points. Albuquerque plans to continue revitalizing the area, which is now sought out as a place not just to visit, but a highly popular area in which to live. Uptown is a popular neighborhood in Albuquerque's northeast heights that has seen an upswing of residents and construction in the past few years. It is conveniently located, close to major traffic arteries, has lots of green space and restaurants. There are both residential and rental options. Uptown is the heart of Albuquerque's shopping district. It is also one of the major destinations for incoming tourists. Although many residents think of the new shopping center when Uptown is mentioned, it is its own neighborhood. The neighborhood came first, the shopping center later. Uptown is a major business center and is also home to Albuquerque's financial district. Shopping is abundant -- Uptown contains both Winrock and Coronado shopping malls and Uptown plaza. Although the Uptown area is small geographically, it packs a big wallop within a small area. Restaurants, shopping, businesses, hotels, housing are all here. If you seek an urban lifestyle, the Uptown area provides more of that big city feel. Learn about the nearby Nob Hill neighborhood, also well known for shopping. You can also learn more about Albuquerque restaurants featured on Diners, Drive-Ins, and Dives. Uptown is roughly bordered by Pennsylvania on the east, San Pedro on the west, Menaul on the north and I-40 on the south. Although the Uptown area does not have an official neighborhood association, it is listed with the city as a designated area. 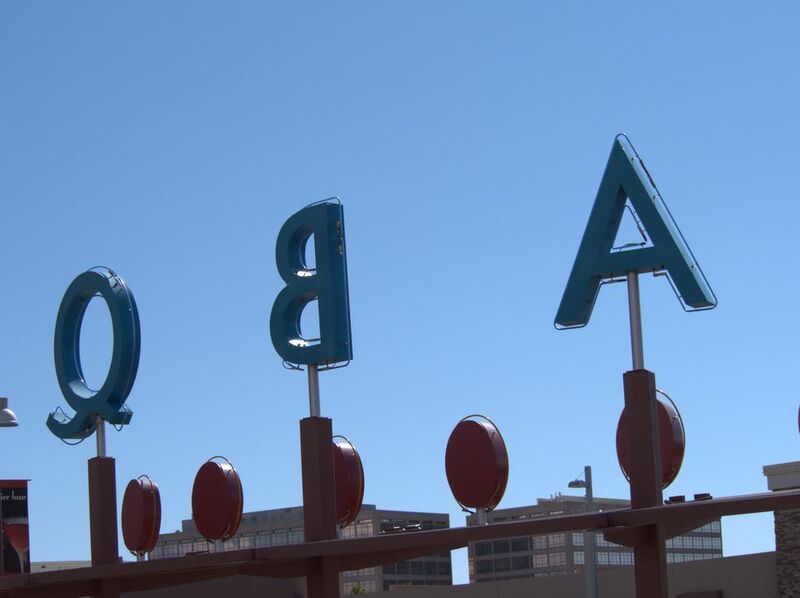 ABQ Uptown Housing offers apartment homes in the heart of the district. Condos, apartments, townhomes and single family homes are all found within the Uptown neighborhood. The residential homes are modest and affordable, with the majority built in the 1950s and 60s. The area is home to mature landscaping and small parks, as well as shopping. The Uptown Shopping Center was created as a pedestrian friendly shopping district. Uptown has major department stores such as Pottery Barn and Williams Sonoma. Coronado Mall is the state's largest indoor mall and features more than 150 stores, from specialty to major chains. The Winrock shopping center's major retailer is Dillard's. In addition to the shopping centers, there are many smaller shops along Louisiana and Menaul Boulevard. Trader Joe's is the major grocery store, and every Saturday during growing season, the Uptown center hosts a ​​Farmer's Market. A Target is situated on the corner of Louisiana and Indian School Road. The Uptown area has a number of well-respected hotels to fit many budgets: the Sheraton Uptown, Hyatt Place, Hilton Garden Inn, the Marriott, and the Hilton Homewood Suites. Driving in and out of Uptown is made easy with the major streets such as Louisiana, Menaul, and I-40, which has on/off ramps at Louisiana. The Uptown Transit Center is located west of Louisiana, off Uptown Blvd. The major bus hub connects to the city's lines. Restaurants are numerous in the Uptown area. They range from national chains such as Buca de Beppo and California Pizza Kitchen to award-winning independent restaurants such as Fork & Fig. Remember These Places in Albuquerque?